All Wraps are $7.99 unless otherwise specified. Can substitute fried chicken cutlet on any wrap. Choice of wraps: garlic & herb | spinach | tomato basil | whole wheat. One coupon per customer. Must present coupon at time of purchase. Not valid with other offers. Limited time offer. for all Occasions & Office Meetings! Please call & ask for Patrick when ordering. Receive a Tray of Garlic Knots FREE with any catering order of $100. Consuming raw or uncooked meats, poultry, seafood, or eggs may increase risk of foodborne illness. Price & menu items subject to change without notice. Tax not included. We reserve the right to correct any errors. 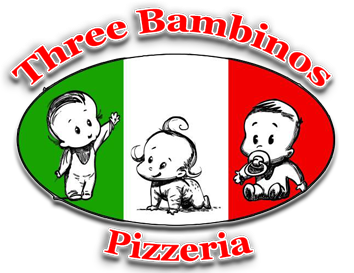 © Three Bambinos Pizzeria 8/18. All rights reserved.